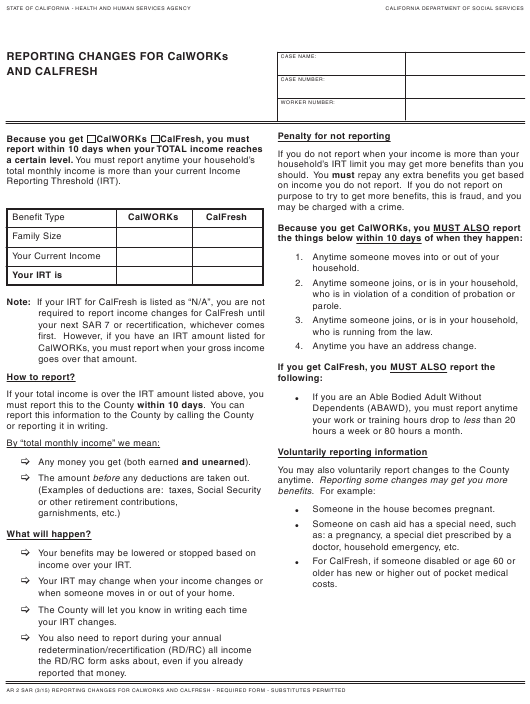 Form AR2 SAR is a California Department of Social Services form also known as the "Reporting Changes For Calworks And Calfresh". The latest edition of the form was released in March 1, 2015 and is available for digital filing. Download a fillable PDF version of the Form AR2 SAR down below or find it on California Department of Social Services Forms website. may be charged with a crime. 4. Anytime you have an address change. or reporting it in writing. hours a week or 80 hours a month. Any money you get (both earned and unearned). The amount before any deductions are taken out. Someone in the house becomes pregnant.